It came into my mind this morning that it would be nice to have some sort of special Easter post. Resurrection Sunday is, after all, the most important celebration in the Christian calendar, no matter what your denomination. Had Christ not died in our place, we would not have freedom from our sin nature; had He not risen into glory, we would have no hope of glory and Life ourselves! All of human history revolves around this great Event. Indeed, it is the very eucatastrophe of history itself. So I desired to have some relevant material to here present. But as the thought came to me this morning, I have little hope of producing something new for the day. I will soon be working on a review of Ben-Hur, which is subtitled “A Tale of the Christ,” but even should I begin that today, I doubt I should be able to finish it in time. Instead, I post here a short story I wrote some years ago. It was one of those rare times where the story just sort of fell out of me and onto the page. I felt it in my heart, I knew in my head exactly what it should be. When I tried to edit it afterwards, it would accept none but the tiniest changes. At any rate, it is relevant to the theme of our Lord’s Passion, and I hope it gives some good to you. In addition to the inspiration of the Gospel stories themselves, I also took inspiration from the Old English poem The Dream of the Rood. I never harmed anyone, except for once, and this was not of my own choice. My home was in the courtyard of the governor’s palace, in a corner mostly ignored by the gardeners because it was just inside the walls, where no fine plants of any kind were kept. During the day I gratefully warmed myself as the sun beat down, but the dryness of its heat often left my skin hard and baked, all the water sucked out of it, and so I also welcomed the cold of night as a respite, though I felt less invigorated in those hours. But more than anything I watched for clouds, not just for the shade they brought in the sweltering noon but because the dark ones brought down the cool waters of the heavens. Oh, how I longed for those waters more than anything else, relishing every drop that burst on my skin and dashed the dust away, seeping into all my eager crevices and injecting my veins with life! With the morning dew, this was all the water I would ever get, for unlike others of my kind who received such gifts from people, I was not beautiful, but thin, brown, and sharp when people came close. They surprised me, they did, the soldiers, when they came in the evening and tore me from my place of rest. I clung desperately to the wall but one drew his sword and hacked me away from it, and then the carrying was easy because I was so light and small. Laughing uproariously, they shouted of “his” stupidity and “his” weakness; what a fool, what a stubborn pitiful fool! Bad for him, but good for a laugh. The soldier held me firmly but tenderly, mindful of my sharpness. Orange light writhed between the great marble columns of the palace doorway, and as they carried me into a side room, closer to the barracks with a dirt floor, I could see more of them all around, some laughing together at a cruel joke, others looking bored, some disgusted, and a few who studiously kept any thought from flickering across their faces. A circle, more or less, they formed, mocking a ragged figure who staggered bloody in the center with his back to me. The pain of the soldier’s sword still lingered where he had hacked me, and I felt my life ebbing away. His hands tightened around my body then, and bent me hard. Excruciating pain, the snapping of some branches, but I had no voice with which to cry out. I was lifted up, twisted upon myself into a circlet, and tied so. They must have grabbed the mocked man to hold him still, but honestly I was too engrossed in my own pain to notice. I was brought towards him, lifted above his head. His eyes glanced up at me, once, and in them I saw the pain and the hurt of every living thing since the creation of the world, all our sorrows and rebellion, all the soullessness, even among plants such as I. Forgive me, I whispered, hoping that he above all men might understand my cry. I see who you are now. Forgive me for what they will use me for. And in his eyes I saw him answer, Do not worry, wild briar, for you will be remembered with honor far longer than they. They jammed me onto his head, winding my branches into his hair and forcing my thorns into his brow so the blood ran over his eyes and dripped off his nose. He cried out. I recognized the voice as that which had caused my ancestors to burst from the new dust of the earth on the third day. When they stopped beating him, he crawled slowly to his feet, and as I rose higher and higher on his head I felt the wind blow in through the open doorway. It flew past us with a cry that sounded to me like the ringing of royal trumpets, and suddenly I felt proud, as though all the flowers and vines and bushes of the world now looked on my place of honor with envy. Story originally published in Santa Clara Review, Vol. 97, No. 2. Reason for Reading: I’ve been curious about the Latin American magical realists for some time, and this title was appealing enough that I just jumped in without knowing anything else about it. Synopsis: An old man with enormous wings appears in a small town, looking bedraggled and very sick, and speaking an incomprehensible language. Thought to be an angel but kept in a chicken coop, he becomes the subject of much speculation and hubbub, yet is never treated with dignity or respect. Finally the day comes that he regains enough strength to fly away. Story Re-readability: Somewhat, for the fascinating realism with which the winged man is portrayed actually makes him more mysterious. That part I love. But the plot is sparse and the human characters simply worthless. Author Re-readability: The depth and detail of Marquez’s imagination is fascinating. His style is poetic and textured, and somewhat dreamlike, even while describing mundane things. Recommendation: Yes, because of the vividly realistic way the magical element is presented, although it’s not a must-read. The story itself is unremarkable and unaffecting, although it develops naturally enough. Obtainability: At many online locations. I read it here. “A Very Old Man With Enormous Wings” is both disheartening, because of the cruelty and callousness of the humans involved, and cautiously inspiring, because the winged man bears his suffering with such patience until he wins his freedom in the end. What the story lacks most strongly is a moral element that could invest it with greater meaning and resonance – something to suggest consequences for actions, or a character who models proper actions, or a sign of spiritual growth. Besides, the few miracles attributed to the angel showed a certain mental disorder, like the blind man who didn’t recover his sight but grew three new teeth, or the paralytic who didn’t get to walk but almost won the lottery, and the leper whose sores sprouted sunflowers. Thus it is unlikely that he is a real angel, but also unlikely that he is completely natural. Marquez’s human characters, however, are generally lacking in admirable qualities, with the exception of the priest, Father Gonzaga, who tries to protect the old winged man and investigate his nature, though to little success on either account. Among the townspeople and the visitors from outside there is much curiosity about the winged man’s nature and existence, but their theories tend to be absurd and insensitive. No one, not even Father Gonzaga, seems able to see him as a person, as one of God’s own children just like everyone else. And Pelayo and Elisenda, in addition to being careless and callous in their treatment of him, seem to lack any true curiosity! They spend the first hours just staring at him, and generally leave him in the chicken coop. He is a burden for them, even as he makes them money. They never try to help him or understand him. This helps us sympathize greatly with the old winged man, even as we are mystified by his apparent listlessness. He doesn’t appear to need much food or water, nor is he much aware of the indignities he is suffering; although, it is important to note, he does feel pain when the crowds shove a branding iron at him, and his dirty living conditions seem to keep him in poor health. Most of the time, he seems almost unconscious, or perhaps mentally slow. And yet when he recovers at the end, it is completely separate from anything the humans have been doing, as if his health is dependent on unseen factors. The final image of him flying away, presumably to some degree of freedom and happiness, is beautiful, even as I remain disappointed in the boorishness of the human characters. The story is translated from Spanish, and in the version I read there were some unclear phrases: “In the midst of that shipwreck disorder that made the earth tremble” is said without a context including a shipwreck, earthquake, or other disaster, and Father Gonzaga counters the crowd’s cockamamie theories with “formulas of maidservant inspiration.” I can only speculate on the meanings. But the mail from Rome showed no sense of urgency. They spent their time finding out if the prisoner had a navel, if his dialect had any connection with Aramaic, how many times he could fit on the head of a pin, or whether he wasn’t just a Norwegian with wings. Norwegians get mentioned one more time in such a way; I’m not sure if there is a specific joke here that I am missing, or if it is merely that Norwegians are considered inherently funny in Latin America. The randomness of the reference is a bit funny. It has been noted that through the winged man’s extraordinary patience, the impoverished couple become quite wealthy, and thus the story might be an allusion to Hebrews 13:2, “Be not forgetful to entertain strangers: for thereby some have entertained angels unawares.” Yet the couple has only improved financially, not spiritually in any way. I find it unlikely that Marquez would intend an angel to appear merely to bring some people money, rather than to help them become better people. But then, maybe Marquez is making a statement about the poverty of many people’s faith, how even if an angel visited them they would fail to recognize it for what it was. In the end, the best thing I can say is that Marquez’s unique and detailed treatment of his concept has inspired me to dream on the subject more myself. Source: Rudyard Kipling’s Tales of Horror & Fantasy, ed. 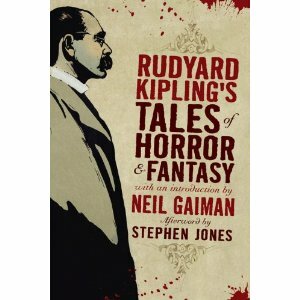 Stephen Jones, with an introduction by Neil Gaiman. New York: Fall River Press, 2010. Synopsis: An unfortunate young man named Penhelder has a peculiar sort of curse, in that every third spring, with alarming regularity and despite all attempts at safety, he encounters some painful accident. Reason for Beginning: Picked somewhat randomly from my large book of Kipling stories; settled on because of its brevity. Reason for Finishing: Was hoping Kipling would provide some answers. Story Re-readability: Not much, really. It’s somewhat amusing, but lacks any real meaning. Author Re-readability: This is a difficult call. From this story alone, I’d say Kipling is fairly re-readable. His prose is graceful and textured, and commanding; by this I mean that he writes with authority, like he knows exactly what he wants to write and how to write it. But I detested his style in “The Wish House,” in which the “texture” of his dialogue utterly overwhelmed my ability to understand what was going on. Another problem he seems to have, is that he often fills his stories with specific details about British India that he never explains, as if his stories are only written for people of his place and time, who would immediately understand his references. If I did get these references, they would undoubtedly become one of the chief strengths of Kipling’s writing, because I suspect that he uses them to suggest quite a bit about his characters. Still, unless you are a student of turn-of-the-century British life and imperialism, you are likely to meet with many terms, phrases, and references you don’t understand. Fortunately, in “The Recurring Smash” these do not impede one’s understanding of the plot. The strongest element is undoubtedly Kipling’s ability to swiftly sketch out a character’s life through specific and believable details, all with hints and references to the outer world, so that you are always aware that this strange little story is just one of many things happening in the world at large. There is also an appealingly droll sense of humor at work here, with Penhelder being generally resigned to his fate, while still frantically trying to avoid it. The ending even resembles the punchline to a joke, and it might even be funny if Kipling would just tell us what he meant. It’s a passably amusing story, but Kipling’s decision to give absolutely no answers regarding Penhelder’s mysterious condition renders it empty of meaningful content rather than intriguingly enigmatic. I simply don’t see a point in recommending it; unless you are a Kipling devotee, I can see no benefit to be got from reading this story, nor anything that you’d miss by skipping it. Reason for Beginning: Western fantasy! Reason for Finishing: Funny and epic Western fantasy! Spoiler-free Synopsis: Gargantuan mountain man, Mad Amos Malone, defends a small town (and its resolutely un-superstitious citizens) from a particularly dangerous wind. Story Re-readability: It’d be pleasant to reread, but I don’t feel the need to. 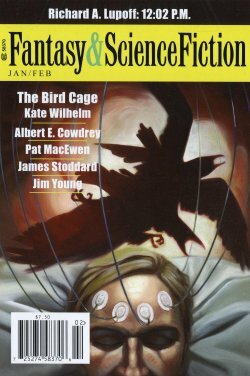 Author Re-readability: I’d like to read more stories about Mad Amos Malone! Recommendation: Yes, especially if you like Westerns with a touch of comedy and epicness. This is a Western comedy of mythic stature, and it’s very fun. The story is compact, focused, and bursting with lively details. Amos Malone is a Paul Bunyan-esque mountain man, with a great horse of matching proportions, who, though sick, rouses himself to defend the small town he is visiting. The inhabitants, used to wind, know nothing about the danger they are in, so Malone explains. When a wind dies, what does it do? he asks them. Why, it fades, they answer. Not always, he says. Sometimes, part of the wind is left behind, trapped between this world and the next. These spirit breezes become angry and frustrated at their inability to move on, and sometimes join together into a great and angry Ghost Wind. Historically it has been the job of mystics, shamans, and priests to pacify them, but now, only Malone is capable to protecting the town. Foster’s prose is warm with personality, with the right kind of semi-archaic rough poetry that we associate with a good Western story. It manages to accentuate the humor while allowing us to take the drama reasonably seriously. There is a folk tale feel, mixed with a few slightly more realistic touches. The few twists are delightful and I dare not spoil them. You’re better off enjoying them yourself! Reason for Beginning: It is in the anthology I have, it is short, and I have heard wonderful things about G.K. Chesterton, who was supposedly one of the wittiest, most intelligent, and most imaginative writers of the early 20th century, and a Christian apologist to boot. This is the first anything of his I have read. Reason for Finishing: It’d be pretty bad to not finish a story this short, but having it be so interesting is nice too.